This lot features a vintage 1964 The Last Man on Earth" original movie theater poster. This poster remains in nice condition as it has been stored flat and has not been folded only rolled. 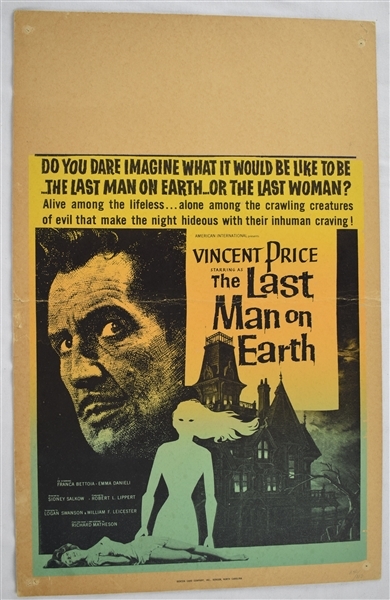 The Last Man on Earth is a 1964 black-and-white science fiction horror film based on the 1954 novel I Am Legend by Richard Matheson. The film was produced by Robert L. Lippert, directed by Ubaldo Ragona and Sidney Salkow, and stars Vincent Price. The screenplay was written in part by Matheson, but he was dissatisfied with the result and chose to be credited as "Logan Swanson". William Leicester, Furio M. Monetti, and Ubaldo Ragona finished the script. The Last Man on Earth was filmed in Rome, with scenes being completed at Esposizione Universale Roma. It was released in the US and the UK by American International Pictures. In the 1980s the film entered the public domain.